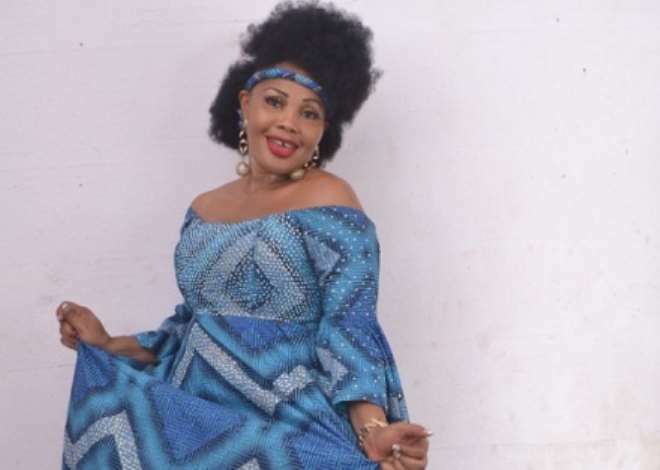 Gospel Music/Word Minister and Song-Writer, Gloria Doyle also known as YeyeGospel (Mother of Gospel) in a TV Interview Earlier this Week on Gospel Rhythmz via AfoRevo TV reveals why people delve into Gospel Music. Why did you went into the assertion of saying 'Nikki Laoye' should stop parading herself as a Gospel Artiste? I think you should be the fourth person asking me this question. What I am just trying to say is this, As a Gospel Artiste, you should be able to minister. We should be able to present songs that edifies the body of Christ. We should be a blessing to lives and not entertain people. I only threw a question at 'Nikki' that if you have an invitation to a crusade or revival, Can you present or minister such songs? NO!!! To me, she is just like every other hip-hop artiste or a contemporary artiste, Not a Gospel singer or minister. That is why I said she should stop parading herself as a Gospel Artiste. Literally, Gospel is the goodnews, what is the content of 'Nikki's song? No, no, no... you see, if you really want to go down to the Bible, where we started from as a ministers or singers, you talk about the levites, those are the people God separated to sing his praise and minister, you can see a separation. God separated them from the remaining tribes of Israel. If you are a levite as a Gospel Artiste, you must be separated. You should not present yourself as other people are presenting themselves and that is what we Gospel Artiste do, we want to be like the world and the Bible says, we should not be conformed with the world. If you want to speak the word, speak the word, if you want to sing the word, sing about the word of God. You should be a blessing and be able to minister into people's lives. You should be able to use your songs to edify people, Not to entertain people and that is where I stand. Don't you think that makes you a little bit controversial? Well, I don't know but right from the inception of Gloria Doyle, they have always known me to be a Controversial Gospel Artiste because I want to speak things the way they are, I want to follow the truth, I want to follow the word of God. I don't want to follow what I see but the word of God. If you are standing as a minister or Gospel Artiste, you should stand as the status and commandments of God commands & ask you to stand. No, I didn't say Gospel Singers shouldn't hold anything like concert. What I said was "if you are inviting me to entertain people, sorry I will not honour such invitation. But if you are calling me to minister, I will gladly honour the invite. Some people say I am talking like this because I combine the ministration of the word of God and singing together but I said NO, if you want me to minister, I will grace such occasion, because I just don't want to come into any gathering and see people carrying chairs up and dancing to all kind of style of music and they go back the same, I should be able to touch their situations and impact deliverance into their lives through what I do. Definitely, that is what makes you a Gospel Minister, you should be able to impact. So I should be of the opinion that wherever you are invited, whether church or any program, the aim is to minister. So if you can achieve that, you shouldnt really care about whatever shows, program, platforms or whatever it is? No... Are you telling me now that because artistes, sorry (No calling of names) are playing in a particular place that is not God ordained, You know, I won't go there and I am serious about it. I have had a lot of invitations and I just tell them, let me know what it is all about. If it is something I can honour, I pray about it but if it's not, I decline. It is not all about the money. If you want to start talking about the money, you will want to be everywhere but if you want to start talking about standing on your call then you know that there are some places you should not be found and events you are not supposed to honour. Well, I just know that I sing, I write my songs, I go to the studio and my producer says this is going to sound better as reggae, dancehall or better as Hip Hop. Most of my songs are Rhythmic, African, I try to add a little bit of pidgin, so that I can get to as many grassroots as I can because I have passion for grassroot people. Which of your songs will you single out as the Best? Hmm... I have released a couple of albums and several singles but I will say my New Released Single Titled:- "PRAY" is the Best. I have received a lot of calls and text from fans and people across the country sharing their testimonies after listening to the song. Personally, I have been blessed in unique ways through the song. Why are you called YeyeGospel? Yeye...(smile) people call me YeyeGospel (Mother of Gospel) because of my stand in the Gospel Ministry and most of the time when people see me at first, they are like wow she is just like every other person but by the time I minister and they are blessed, they just call me a mother, saying you are different, you just stand on your own. Why do you think a lot of people are going into Gospel Music? Ewonda... If I am to answer this question, I will tell you that it's very vast and it's going to take a lot of time because I am going to digress a little bit, but let me tell you the little I know. You see, a lot of people try to achieve fame, and they find out that oh, through the Hip Hop industry, they don't really have the kind of money they need to attain that height, so they fall back into Gospel Music. A lot of people are into it for Cut short to fame than those that are really called into the ministry, you understand. What I just want to tell you is that whatever purpose anyone comes into Gospel, there is always a test of time. I can name names, I know of someone that started as a Gospel Artiste, but because she felt it was slow, she delved into Hip-hop and as we speak, she is no where to be found. Yeah, she is existing but when it comes to commanding in the Gospel sector of the Entertainment Industry, She is no where to be found. I recall that in 2007 and 2011, she was really holding grounds. What I am just trying to say is that, if you are coming into Gospel Music, there must be a call on you. The reason you see people bring the world into the church is because they don't really know their call. They just want to do it, they just want to be there. But if you have the call of God upon your life, you should know that there is nothing that should make you conform because the Bible says "you should not be conformed, you are in this world but you are not of this world". If you are able to understand that at the back of your mind, you should be able to differentiate it and say No this is my cross line, I shouldn't go beyond this place and I shouldn't do beyond this. So they do Gospel Music for fame, recognition and money? Yeah, a lot of people do Gospel Music for fame. Listen to me, in those days when Don Moen was ministering back then when we were growing up, whenever he is singing or even in the church, during choir ministrations, you see people being touched by the Holy Spirit. By virtue of me been a Gospel singer, before, I don't even know what a lot boys are holding in Pepsi bottle that they bring to church and we all say oh, maybe he or she is thirsty and you see them dancing at the end of the day. I learnt and got to know that it was just a mixture of some kind of drugs. Inisde the church? And you see them dancing unknown to anyone that they are under the influence of drugs and not the Holy Spirit at work in their lives. How do you feel been nominated in three categories of the forthcoming Africa Gospel Awards, 2018? I give all Glory to God Almighty. I feel very honoured for the nominations "Best Song of the year", Most promising Artiste of Repute" and "Next Rated Gospel Artiste". I appreciate the award organisers for recognizing Kingdom worshippers and ministers of the Gospel.